Patch on left courtesy of by Mike Staehle, on right by Darryl L. Baker. 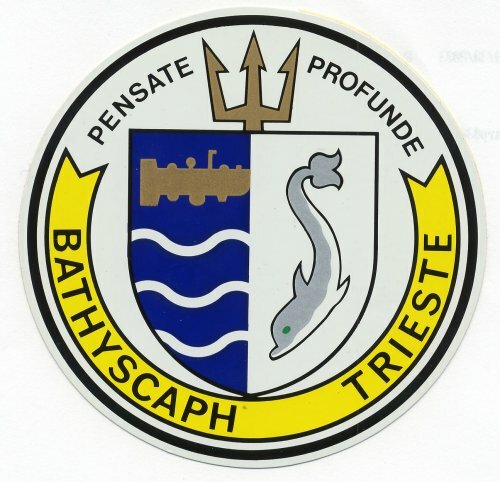 Bathyscaph. 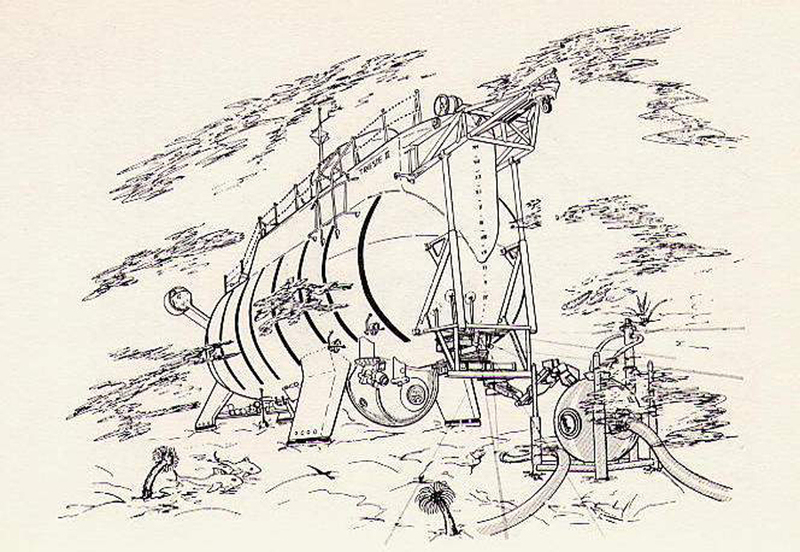 L/B/D: Designed by Auguste Piccard. Built: Mare Island Navy Yard, Vallejo, Calif.; 1963. Commissioned Trieste II (DSV-1); June 1971, her hull number was changed to (DSV-1), and in May 1984, when she was assigned to Submarine Development Group 1. She was moved to Keyport in 1985. 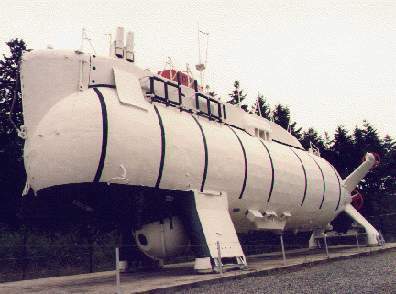 Final Dispostion: Taken out of service in 1984, she was put on display at the Naval Undersea Museum in Keyport, Washington. 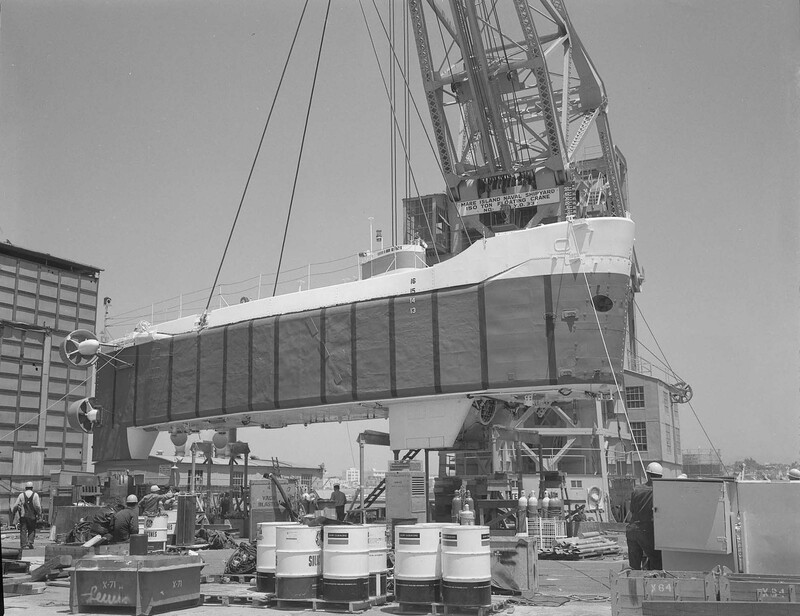 653k Close-up of Trieste II's gondola and underside shoring and wiring while onboard Port Defiance (LSD-31), 28 April 1963. USN photo # 80-G-1081351, now in the collections of the National Archives, courtesy of the National Museum of the U.S. Navy, via flickr.com. 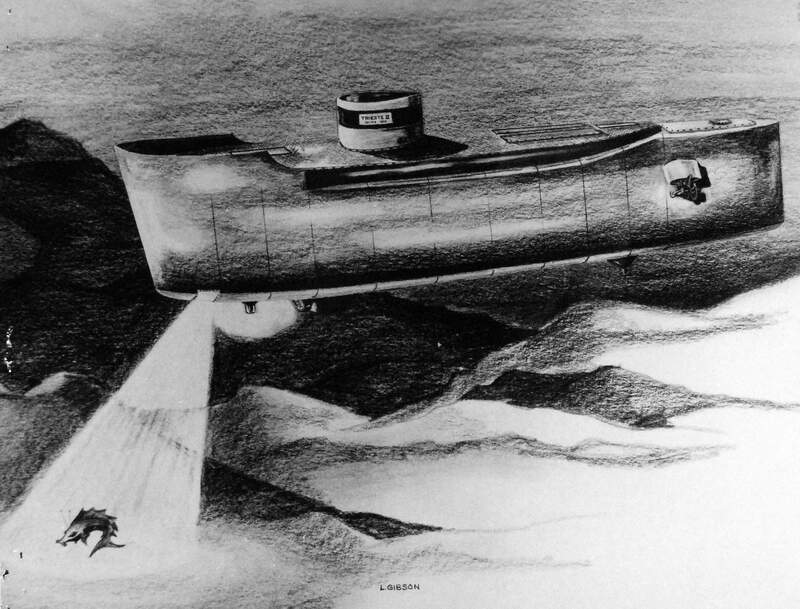 1.11k Artist's conception of Trieste II – a streamlined version of the Navy's bathyscaph Trieste is scheduled to begin tests off the California coast in January 1964, Lieutenant D.L. Keach, USN, Officer-in-Charge of the vessel then said. The renovated Trieste II, built by the Mare Island Naval Shipyard, will have increased speed and endurance, and decreased draft. The operating sphere in the $375,000 Trieste II is the 13 feet aft of the bow. 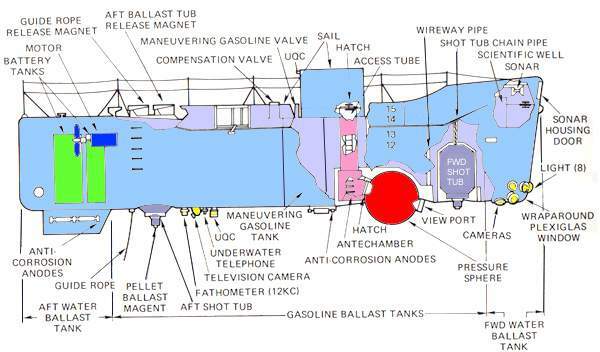 Keach said this would allow the bathyscaph to get closer to areas during research. Photograph released 21 November 1963. USN photo # USN 711389, Photographed by PHC C.L. Wright, courtesy of the National Museum of the U.S. Navy, via flickr.com. 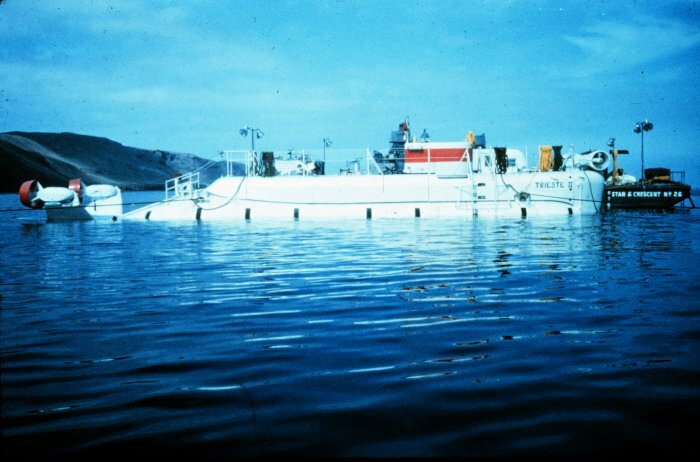 209k The Trieste II is seen shortly after her new float was completed at Mare Island in November 1963. USN photo # 63526, submitted by Darryl L. Baker. 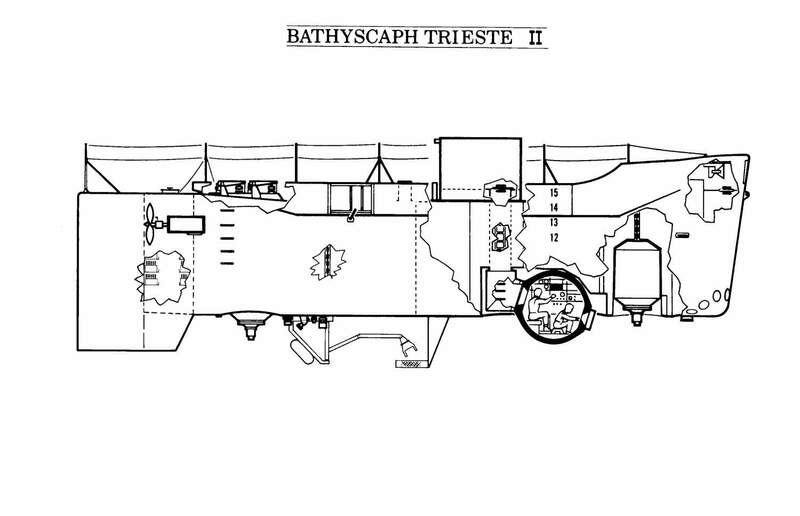 87k Layout of the Trieste II. USN photo submitted by Darryl L. Baker. 29k Bow, stern and port side view of the Trieste II. 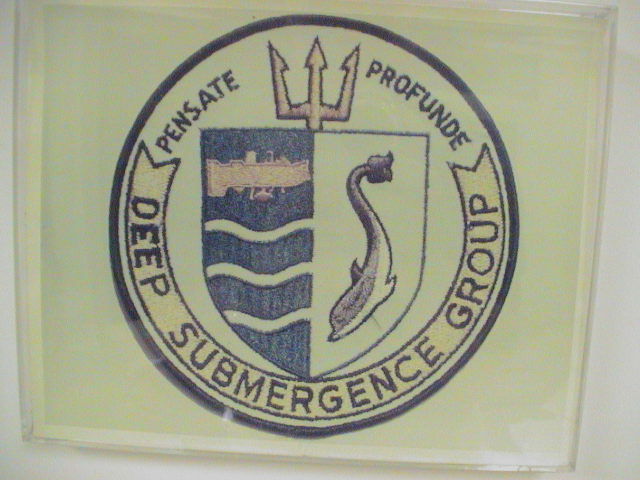 Courtesy of www.submersiblesubmarines.com. 36k Cut out of the Trieste II. Courtesy of submersiblesubmarines.com. 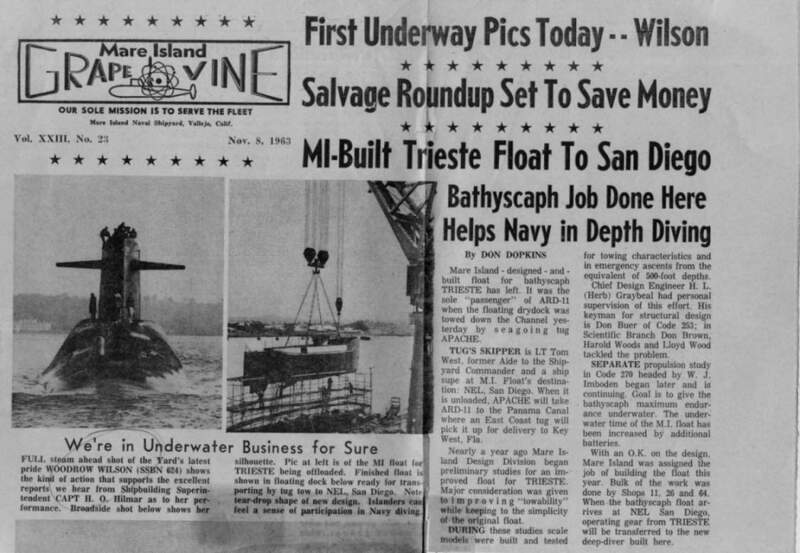 113k Newspaper clipping from the Mare Island "Grapevine", 8 November 1963 reporting on the Trieste's II delivery to the White Sands (ARD-20) which will then be towed by the seagoing tug Apache for transport to NEL San Diego, Panama Canal and finally to Key West, FL. USN photo submitted by Darryl L. Baker. 262k Trieste II reconfigured with a new float to support a new and larger battery and propulsion system. 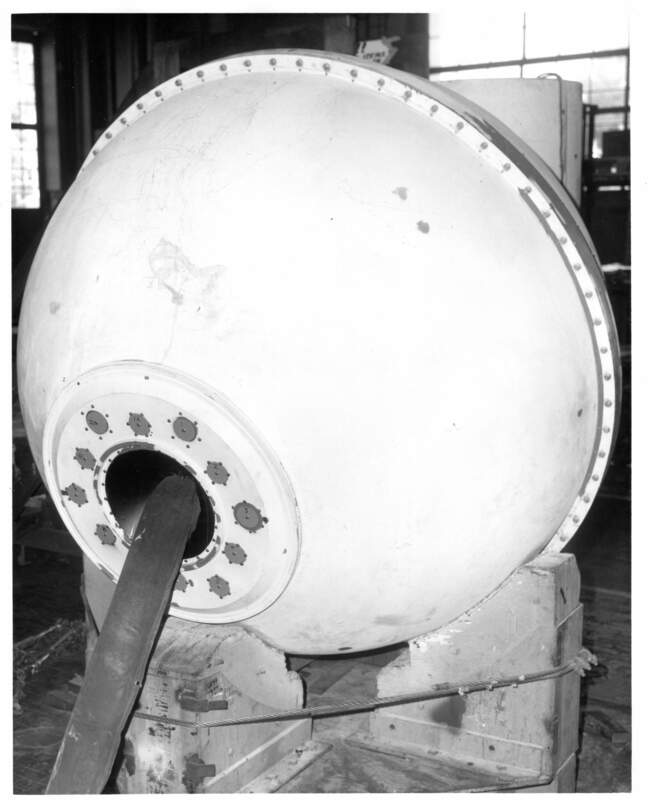 This configuration went on the second survey of the Thresher (SSN-593) wreckage, circa mid 1964 at Mare Island, California. Note the 150 ton floating crane sign in the background. USN photo submitted by Mike Staehle. 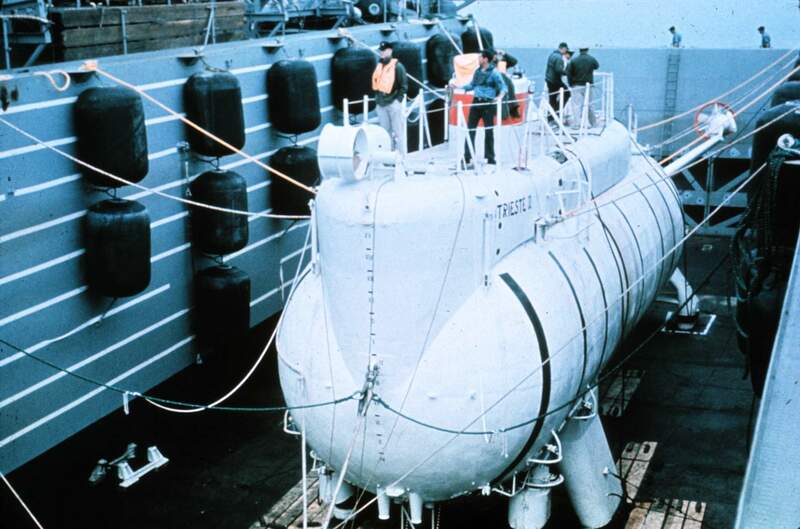 1.10k Despite the tragic loss, Thresher (SSN-593) afforded the Navy an opportunity to evaluate advanced equipment and improve techniques of deep water search and inspection. 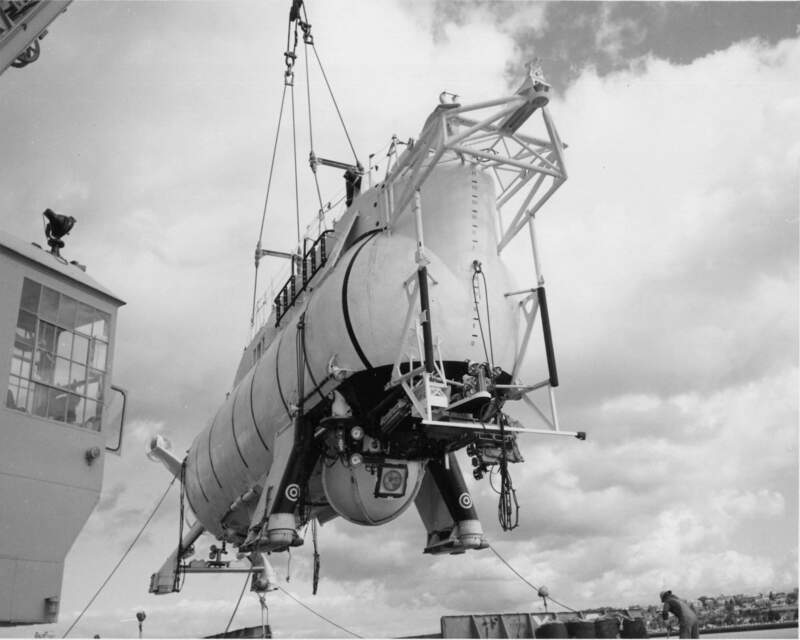 Photographs were taken at a depth of more than 8,000 feet with an improved underwater camera-magnetometer device towed by Mizar and operated from the surface by personnel of the U.S. Naval Research Laboratory. Bathyscaph Trieste II at Boston Naval Shipyard being prepared for towing to the search area 330 miles west of Boston. USN photo # KN-9302C, courtesy of the National Museum of the U.S. Navy, via flickr.com. 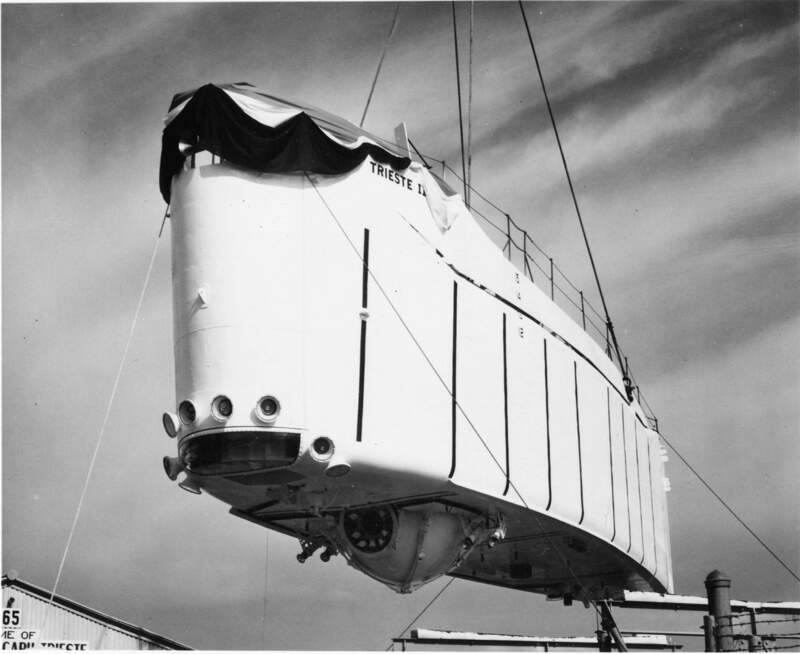 811k Two views of the Trieste II (Teardrop shaped float) being transferred from the quay wall at Mare Island to the Monticello (LSD-35) for shipment back to San Diego after her overhaul. 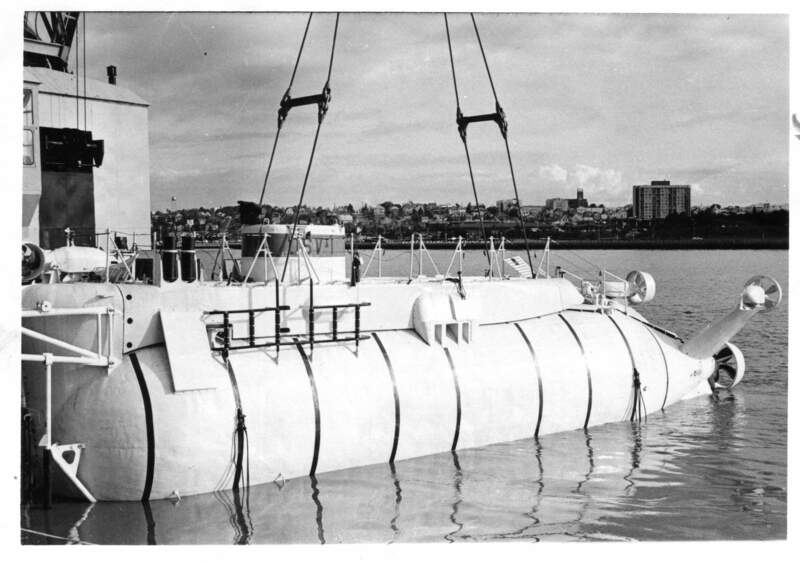 This version of the Trieste II float was built at Mare Island in fiscal 1963 (10/1/62-11/7/63). These photos were taken on 19 May 1966. Photo from the files of the Vallejo Naval and Historical Museum via Darryl L. Baker. 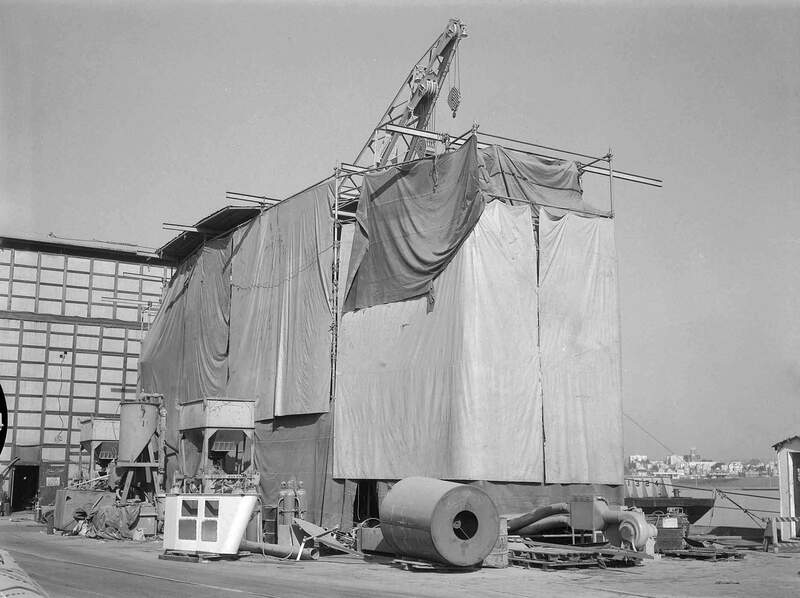 1.27k Overhaul enclosure for the Trieste II on the quay wall at Mare Island on 19 January 1966. 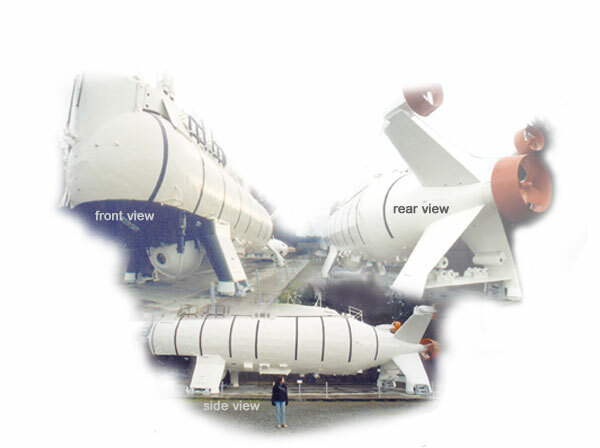 YF-1324 can be seen in the background. Photo from the files of the Vallejo Naval and Historical Museum via Darryl L. Baker. 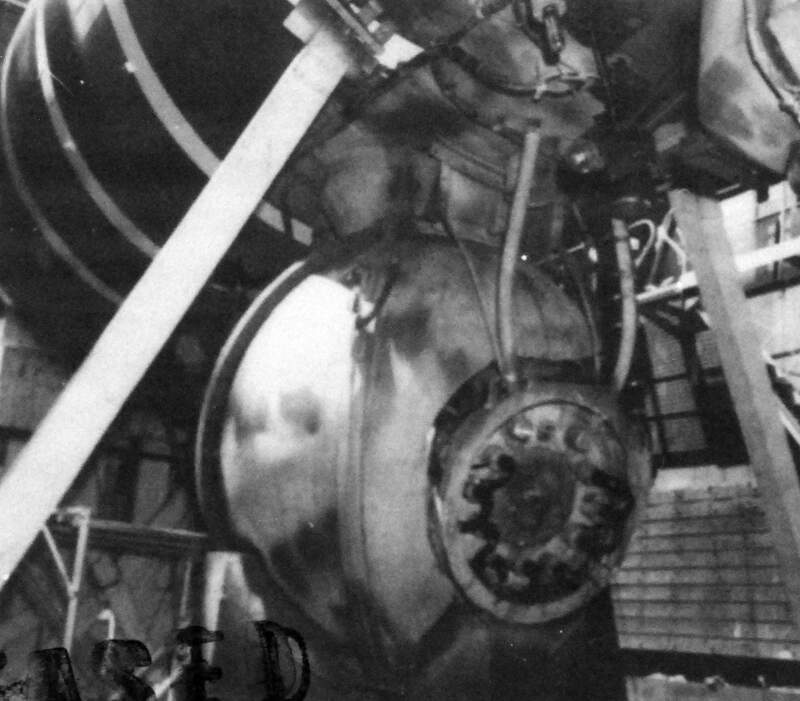 582k Trieste II's pressure sphere under overhaul at Mare Island on 19 January 1966. Photo from the files of the Vallejo Naval and Historical Museum via Darryl L. Baker. 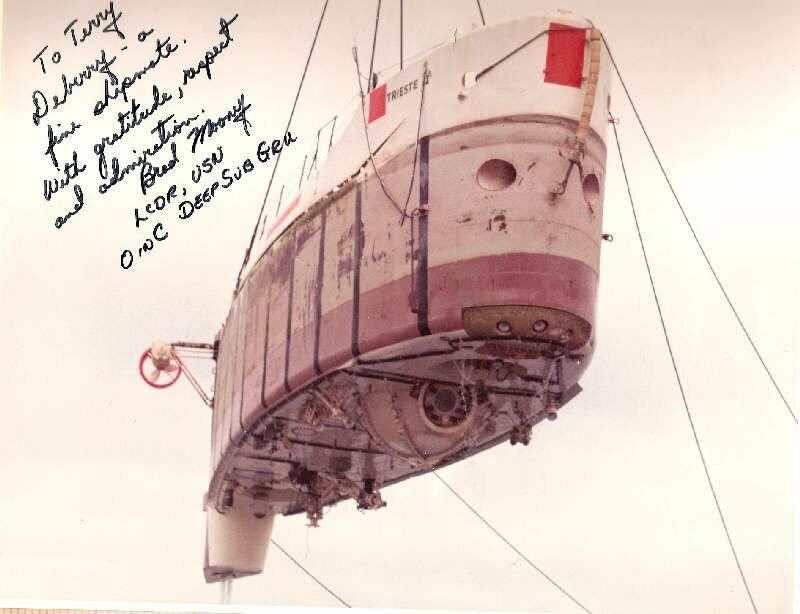 48k View of the underside of the Trieste II as it is hoisted aboard White Sands (ARD-20) , circa 1966. Courtesy of Terry Ewing. 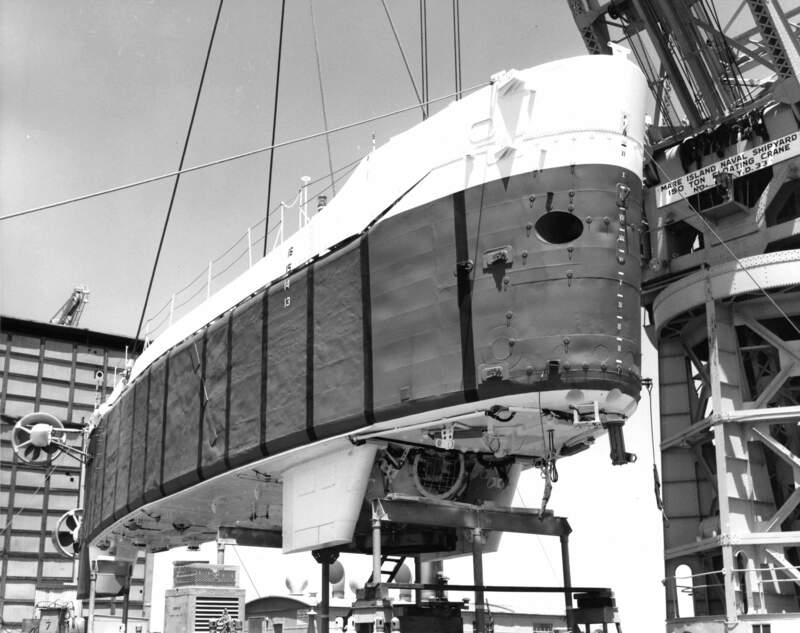 206k Trieste II bow view while being transported aboard the support vessel White Sands (ARD-20) in 1969 prior to going to the Azores to survey the Scorpion (SSN-589) wreckage. 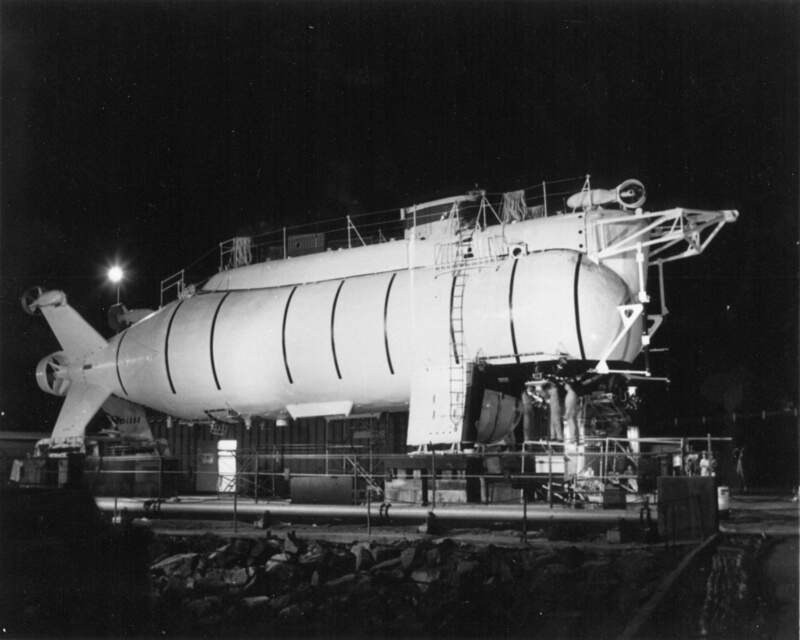 The Trieste II was getting ready to go through a launch operation which took all day: fill the float with 66K gallons of 115/145 avgas; fill the shot tubs with 22 tons of #10 steel shot and otherwise get her ready for towing and subsequent rig-for-dive operations. The LT. with the orange life jacket is the contributor of three photos on this page. USN photo submitted by Mike Staehle. 587k Trieste II & White Sands (ARD-20) during the search for to find the remains of the Scorpion (SSN-589). Courtesy of Tommy Trampp. 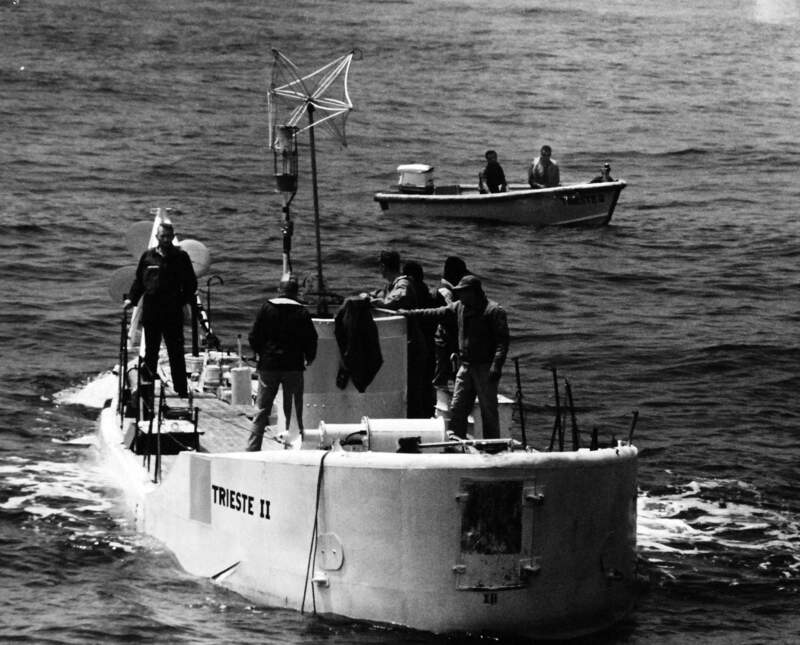 63k Trieste II in 1969 prior to going to the Azores to survey the Scorpion (SSN-589) wreckage. Trieste II is anchored to a barge at San Clemente Island.bThe bridge of the support vessel, White Sands (ARD-20) is in the background. USN photo submitted by Mike Staehle. 183k The Trieste II is shown in April 1975 at Mare Island Naval Shipyard near the completion of her overhaul at the yard. Trieste II was in overhaul at Mare Island from 3 December 1973 to 22 May 1975. USN photo # MSA 130555-4-75, submitted by Darryl L. Baker. 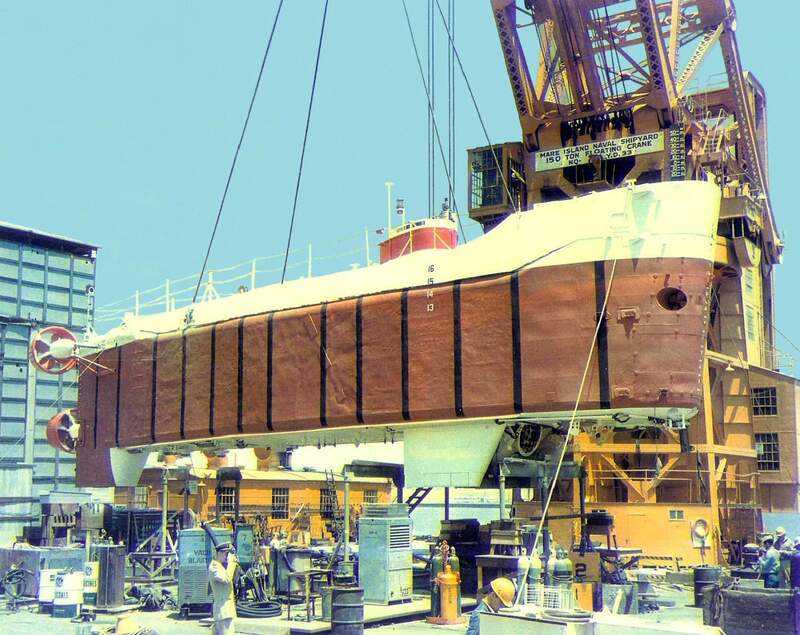 447 This photo of Trieste II appeared in the 2 May 1975 edition of Mare Island's newspaper Grapevine marking the end of her overhaul at the shipyard and transfer to NAS Alameda for dockside testing. Photo from the files of the Vallejo Naval and Historical Museum via Darryl L. Baker. 207k The Trieste II is seen on a barge date and place unknown. USN photo # 119147 submitted by Darryl L. Baker. 464k The Trieste II on the bottom. USN photo courtesy of Scott Koen & ussnewyork.com. 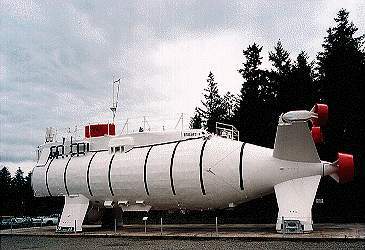 61k Trieste II, on permanent display at the Naval Undersea Museum in Keyport, Washington. Courtesy of U.S. Navy. 21k Trieste II port side view, on permanent display at the Naval Undersea Museum in Keyport, Washington. Courtesy of pweb.netcom.com.